Marvel’s Agents of S.H.I.E.L.D. : Based Upon the Novel “Push” By Sapphire won’t have an easy time of it. For one thing, there’s that title, which looks a bit, er, corporate and legal even without the jokey subtitle I added to it. (To be clear, this is not based on the novel Push by Sapphire.) For another, it’s a comics-derived series arriving on network television during the golden or maybe platinum age of comic-book movies — a time in which superhero pictures have the biggest budgets, the most relentless PR campaigns, and the most vigorous cultural presence of any major genre, eclipsing straight science fiction, horror, even traditional action pictures. Such films as Man of Steel, Christopher Nolan’s Batman trilogy, and the interlocking Marvel Universe movies are so overwhelmingly immense and glitzy that in comparison, a show like this can’t help but look and feel anemic. Sure enough, the opening of tonight’s pilot has that late-seventies feel of The Incredible Hulk and The Amazing Spider-Man live-action TV series. The pilot’s prologue spotlights an ordinary man displaying superheroic powers. It’s supposedly set in East Los Angeles but might as well have been shot on the urban backlot set at Disney World, and it treats a medium-size explosion and a guy climbing a wall as if they were utterly dazzling displays of production value. But hey, it’s TV — and to its credit, series creators Joss Whedon, Jed Whedon, and Maurissa Tancharoen don’t knock themselves out pretending they’ve got unlimited cash to throw around. Agents of S.H.I.E.L.D. (I refuse to bow to Marvel every time I type that title — sorry, Marvel) is set in the aftermath of the Battle of New York, the awesomely overscaled climax of The Avengers, which Joss Whedon wrote and directed. The show embraces its relative smallness, building much of the action around knowing banter and the occasional close-quarters fistfight. The most spectacular moment in the pilot might be a whirling shot of an agent on a Paris rooftop that reveals the Eiffel Tower in the background; it’s a shot that says, “Look, we had enough money to shoot this in Paris!” or “Look, we had enough money to make you believe we shot this in Paris!” Either way, it’s cool. Clark Gregg’s Special Agent Coulson from the Marvel films is miraculously resuscitated, although the pilot episode doesn’t explain precisely how that came to pass. He explains right off the bat that he’s running a kind of surveillance-and-early-interdiction operation. Its mission is to scrutinize the civilian population for supervillains, superheroes, and monsters, and deal with any associated problems quickly and appropriately, so as not to waste, say, the valuable time of Iron Man or the Hulk. The best-case scenario is that S.H.I.E.L.D. deals with potential issues so efficiently and intelligently that the general public has no idea they’re even in this line of work; it’s a corollary of the notion that law enforcement’s main job is to preserve the peace, which means that if things are going smoothly, we barely notice them. “We’re the line between the world and the much weirder world,” explains Coulson. If you’re any sort of comics nerd, it’s intriguing to think of Agents of S.H.I.E.L.D. as a sideshow to the three-ring-circus of the Marvel movies. I’ll be curious to see how much overlap there’ll be with the films; my guess is not much, except maybe to set up movie story lines in season or mid-season finales — and they’ll probably be judicious about using the show that way, because the more this program becomes known as an “ancillary property” that doesn’t stand by itself, the less compelling it’ll be for Marvel Universe junkies. 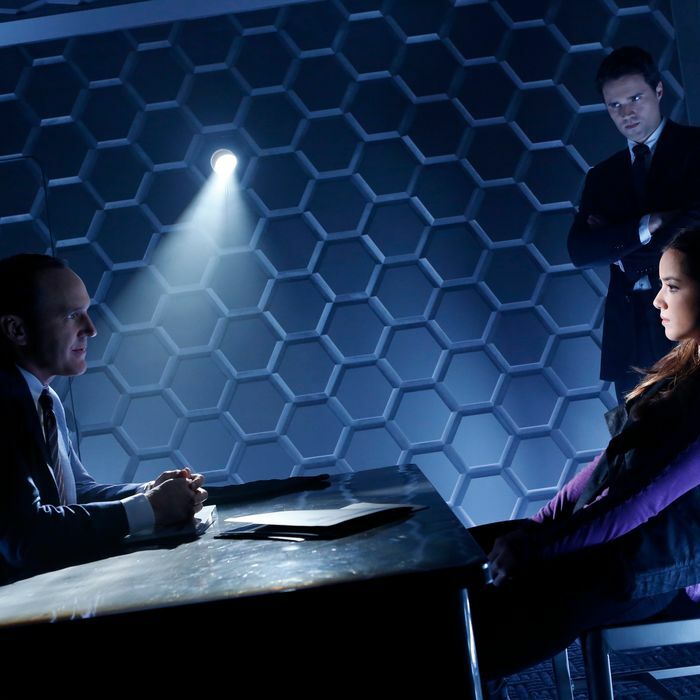 TV Review: Agents of S.H.I.E.L.D.